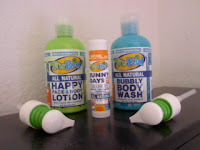 Liz at TruKid was sweet enought to send me 3 of TruKids products, TruKid All Natural Bubbly Body Wash, TruKid All Natural Happy Face & Body Lotion, And TruKid's Sunny Days All Natural sunscrean stick. The first thing that caught my eye was the bottles bright colors, Bright green and blue. The actual product is a clear liquid. It's so funky! You and your kids will love it! The second thing that perked my intrest was the scent of the products. The bubbly body was has a yummy citrus smell like orange. The lotion has the same sent but only more mild. I fell in love with the bubbly body wash when I first used it in the shower as a body wash, the scent of the product filled the air with its Yummy smell. While washing with the body was it foamed up nicely and I only had to use a dime size drop to wash my whole body. As I dried i noticed that it didn't dry my skin like other "Natural" washes. Your kids and even you will love washing with this. After my shower I dried and applied a generious layer of TruKid's Happy face & body lotion on my arms, legs, and shoulders. I like to air dry so that often leaves me a little dry. when I applied this I smelled the citrus instantly and the lotion didn't leave me sticky like other kid lotions I have used in the past. It moisterized my skin nicely and left me smelling sweet all night and also filled the bedroom with its nice citrus aroma. I applied the Sunny Days all natural sunscreen on my nose, chin, forehead and cheeks before I went outside to work in the yard. I have fair skin so I burn easy, While working out in the yard all day even with the clouds out I burn, But I didn't have any red marks, burns or ouchies when I came inside that day. I was fully protected and the product didn't sweat or wipe off during my heavy activity. ♥ I receive no monetary compensation for this review. I was provided TruKid products to try and give my honest opinion.